Steinway is the priciest of the U.S.-made pianos, and the best-known, and considered by many to be the highest quality, despite miscellaneous and sundry quality control problems in recent years. Steinway is still considered by most pianists, musicians, and the general public to be the “standard” piano, and is often advertised as such, (“standard” in this sense meaning “best,” “the example,” or “model,” that all other pianos aspire to, or the criterion by which all other pianos are judged; and not the common definition of standard as “normal” or “garden variety,” i.e. the piano that everyone buys.) The majority of the world’s professional concert pianists perform on Steinway pianos, either older or newer ones, and this has helped establish Steinway’s reputation. Additionally, and most importantly, a great deal of research and effort has gone into the design of the Steinway piano, over the years; as long as that design is executed faithfully, it is an excellent piano. If there are problems, the concert artists (a fussy and meticulous bunch) will kick or complain, and whatever isn’t right usually gets fixed, sooner or later. Steinway is much more than just a piano. There is a great history and legacy behind the firm, which has been around for nearly 150 years (Established 1853), and when people buy a Steinway they are usually also buying all the things it stands for, too numerous to go into in depth in the space of this short article. Steinway’s small production (roughly 5,000 pianos per year between the New York and Hamburg factories) helps insure that the pianos stay in high demand. Numerous volumes have been penned about Steinway over the years: the piano, the people behind the name, the artists who played the instrument, and the artists who built it. Steinway’s main claim to fame is its grands. While they do currently make 3 sizes of verticals (or uprights), and while the verticals are very nice, with a quality of construction similar to that of the grands, they are quite expensive compared with the offerings of some other manufacturers, and for what you pay, may not represent as good a value. (For a explanation of what I mean by value, see the discussion of value under the Baldwin heading below.) The best vertical in the line-up is the tallest, and the one that has been around the longest: the model K-52 (52″) which is based on a design that has been around since the early 1900’s. The main problem tuners (and owners) have with Steinway verticals is that they are difficult to tune. You have to find an extremely competent tuner to tune them properly and get them to stay tuned for any length of time; and they frequently take the tuner longer to tune, which may be one of the reasons why we often get calls from Steinway owners asking for someone “qualified to tune Steinways,” as opposed to other pianos. The grands, however, don’t seem to have this problem, and on the contrary, often seem to be easier to tune than many other brands of pianos. Once the tuning problem is solved, the verticals can be quite rewarding to play. Steinway currently makes five sizes of grands: the Steinway models S (5’1″), M (5’7″), L (5′ 10 1/2″), B (6′ 10 1/2″) and D (8′ 11 3/4″). (These are the sizes produced at the New York plant. The Hamburg, Germany factory also produces the models A (6’2″), “C” (7’5″) and “O” (5′ 10 1/2″), models formerly produced in New York but now discontinued.) The Models O and L are, as you can see, the same length, and are actually very similar in many ways; perhaps the most obvious distinguishing characteristic is that the “O” has a round tail whereas the L has a more squared-off one. This squarish tail is supposed to give the “L” more soundboard area and a better tone, but some people (generally those who like the tone of the “O” better) question whether this is really true. Word is that the “O” is actually preferred in Germany, hence the reason for its continued production at the Hamburg plant. 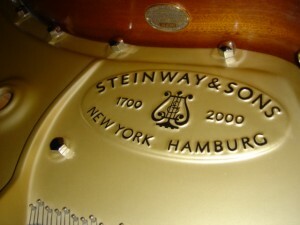 Hamburg Steinways are very difficult to obtain in the U.S. Steinway imports new Hamburgs from time to time, and sells them occasionally through its dealerships, but the availability is far from predictable, or dependable. Far more model C’s, A’s and O’s, from the New York factory, and also Hamburg Steinways, of various models and sizes, are available on the used market. Many pianists feel the Model A was Steinway’s best piano, and vintage model A’s are especially prized, and often rebuilt. There were actually 4 different Model A designs: The first two had round tails and 3 bridges and measured around 6’1″. The last two, measuring either 6’2″ or 6’4 1/2″, with squared off tails and two bridges instead of three, are generally considered the most advanced design, although they all are great pianos. Other pianists feel that the Model B is superior. The “B” is found in many concert, symphony and recital halls, churches, schools, conservatory and University teacher’s studios, theatres, auditoriums and music centers, and also, homes. Many people still find it a bit too big, though, and opt for a Model L, O, or A, any of which represents a good compromise point between tone quality and size. For most people, any one of these Steinway grands around 6′ is all they could ever want in a piano. The model S is for people who want a grand and the feel of a grand action but who have very little space. The sound quality, while amazingly good considering it’s size, is not as good as that of some taller verticals, and not a lot of model S’s are sold. The models “M” and “L” are probably Steinway’s most popular pianos for the home. The “M”‘s can actually be very nice, all except for some of the lowest bass notes, for which the piano is really still a little too short to achieve a good tone. The models “L”, “B” and “D” are really Steinway’s most serious (U.S., currently-produced) pianos, and the ones most often used by concert artists, professors of music and other serious musicians. The model D is, of course, the flagship of the Steinway grands and the one most often used by professional concert artists in solo recitals and appearances with orchestras. Although it is considered by many to be too big for anything but concert halls and auditoriums, there are actually quite a few people who have them in their living or music rooms; and rooms that are not that big, either. Some Model B’s seem to have as much or more sound volume than some Model D’s, and it is sometimes said that it is easier to find a good “B” than it is a good “D”, but this could be simply because there are more “B’s” out there, and the “D’s” are often found to be in all kinds of different conditions, running the gamut between proper maintenance and neglect (even when new at the dealer’s.) A Model “D” that has been properly maintained will always have a superior low bass to a Model “B”, and generally excel in other areas as well. My perception, from having practiced and performed on myriad different Steinway grands over the years, is that a Model D is really a completely different creature than the other grands, requiring not only special treatment, and a special playing technique, but also giving a sound and a feel that none of the other grands can give. (Some pianists feel D’s are harder to control, especially in attempting to play softly or evenly; this could, however, be attributed to the fact that, being concert instruments, they are usually voiced rather brilliant or bright, which requires some getting used to. Playing to fill a concert hall also requires a very different technique than simply playing in one’s home.) Once you have become accustomed to playing on a “D”, it’s very hard to go back to a lesser instrument. Steinway’s 2nd line piano is the Boston, currently built in Japan by Kawai. Steinway’s 3rd line piano is called the Essex; Essex grands are built for Steinway in South Korea by Young Chang. Essex verticals, depending on the model, are now made in either South Korea or China. Both Boston and Essex piano lines are reportedly designed to Steinway’s specifications and then built for them by the Asian manufacturers. The question often comes up whether one is better off buying a Boston or a Kawai grand, since the Boston pianos are made for Steinway by Kawai. The Boston piano is really a different creature from the Kawai models and should be treated as such. Some pianists feel that the Boston has a more “vintage American piano sound” with a bit more warmth and richness to it. Others can’t see much difference, or prefer the Kawai. Supposedly one of the differences between the comparably sized Kawai and Boston models is that the Boston has a wider tail and thus more soundboard area, and longer bass strings, although to look at the actual specs, this seems more like hair-splitting; having more soundboard area does not always make the sound of the piano more appealing (many people prefer the sound of the Steinway O to that of the L) and at least in one instance, comparing Kawai’s 5’5″ RX-1 to Boston’s 5’4″ GP-163, the Kawai has the bigger soundboard and just as long a #1 bass string. Steinway design of the Boston piano is progressive in some areas and more traditional in others: to distinguish, perhaps, the Boston from the Kawai, Steinway emphasizes that Boston pianos have all wood action parts (Kawai has pioneered the use of ABS and ABS carbon action parts in their pianos, which parts they say are lighter, quicker, more responsive, and not as affected by humidity as wood action parts)-so the gauntlet has been thrown down. When they first came out the Bostons were more expensive than the Kawai models, but due to the devaluation of the U.S. dollar recently things have changed . From what I can see, this year the list prices on Boston and Kawai similar size models seem close enough so that, for all practical purposes, price difference should not really be a major factor in a buying decision. Those considering buying either a Kawai or a Boston really should try both to see which they like best. Both brands really have much to recommend them, and both incorporate many design features of high quality instruments. Update (2007): Steinway has just recently resumed manufacturing, at the New York Steinway factory, two models which for decades have only been manufactured at the Hamburg facility. These are the models A (6’2″) and O (5’10 3/4″). Production of model A’s in New York ceased during World War II. Production of the Model O was suspended in 1923, when it was replaced by the Model L. It appears that, for the present, Steinway New York is continuing production of the Model L along with the O, although there were reports in music trade magazines and other sources that the L was being discontinued. The two pianos are essentially the same length, although the L, by virtue of its shape, has a larger soundboard. The model C (7’5″)was no longer produced in New York after 1936. It is still only made in the Hamburg factory.